2 New, Must Have products… available to buy in the salon. Scientifically formulated to achieve Rich, long Lasting Bronze Colour in as little as 1 Hour. Alcohol Free formulation promises not to dry your skin out, allowing the antioxidant and moisture enriched solution to leave your skin feeling smooth and silky to the touch. Aloe Vera infused to deliver a healing soothing moisturisation effect to the skin. Breakthrough Fragrance technology eliminates odours at source replacing them with a fresh and Sunny fragrance with hints of citrus berries combined with musk and light woods to keep you smelling fresh and clean. Developes in just 1 hour for a rich dark colour but for an even darker colour maximum depth is achieved in 3 hours. You to choose how dark you would like to be! has been used for many years throughout the islands of Hawaii. More recently it has become more mainstream in the rest of the world. Kukui nut oil is used to moisturise and protect the skin from sun, salt, wind and other environmental elements. Kukui oil is also used for minor skin irritations, wounds, and burns. The fatty acids present in kukui nut make it a superior moisturising product for dry skin and hair. Kukui nut oil penetrates the skin easily and leaves the skin feeling silky and smooth. 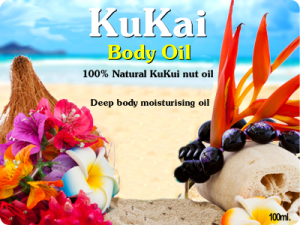 Kukui nut oil does not leave the skin feeling greasy. This oil contains vitamins A, C, and E, which are antioxidants known to protect the skin and prevent free-radical damage to the skin cells. Kukui nut oil can leave even the driest, dullest, aging skin looking healthy and radiant. Kukui nut oil also works well as an under eye treatment for the prevention and softening of crow’s feet. Kukui nut oil is easily absorbed by the deepest layers of the skin, and forms a protective barrier on the skin that protects against environmental damage. Kukui nut oil is used to treat sunburns, windburns, eczema, chapped skin, psoriasis, dry skin conditions, acne, scars, lesions and maturing skin. Hawaiians use kukui nut oil on dry hair that has been damaged by overexposure to elements such as the sun and wind. The amino acids and essential fatty acids present in kukui nut oil penetrate the hair shaft and leave hair looking healthy and moisturized. Kukui nut oil can be used as a treatment for an itchy scalp or dandruff. It has the same regenerative effects on the hair and scalp as it does for the skin. The gamma-linoleic acid present in kukui nut oil makes it useful as a leave-in treatment that conditions, imparts shines, and restores moisture to hair.